City, University of London, has played host to a wide range of social businesses and future ethical entrepreneurs at the second instalment of the annual Social Enterprise Festival. The two day festival saw more than 500 people attend and take part in a series of workshops, debates and promotional events which explored how enterprises can benefit society and drive positive change forward through business. The event was open to the public and designed to encourage students and entrepreneurs to present their ideas and equip them with the necessary skills to start their own social enterprises. Attendees also had the opportunity to shop at the Social Marketplace, a drop-in market at CityBar, where social enterprises from around the UK sold their products and explained to audiences how their businesses represent change and positivity. Student Birseem Tiki (BSc Adult Nursing), said: “It is great talking to the stall owners and to hear about how their initiatives promote sustainability and equality. “Events like these are brilliant as it makes people aware of things that they would not come across anywhere else. City highlights the issue of sustainability and how we need to limit our waste. The Pitch For Good competition, a stage for young social enterprises to present their business ideas to a panel of experts, saw eight enthralling presentation of ideas which aim to tackle social problems. The panel consisted of Mike Mompi, Director of ClearlySo, Professor Caroline Wiertz, Associate Dean for Entrepreneurship at City, Raj Shankar, Business Manager at Santander and last year’s winners, Sabine Opris and Elena Sokolova, co-founders of Tryatec. 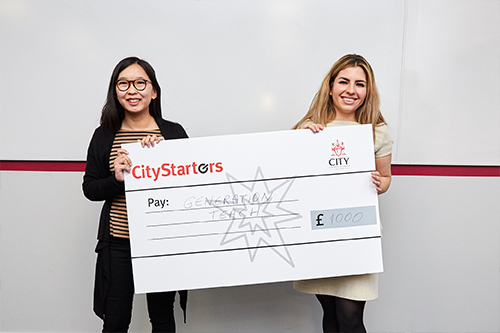 Nicola Alexander (BSc Optometry) and co-founder of Generation Teach, a scheme designed to improve education standards in South Africa, won first prize and took home the £1,000 to put towards her business. Lucy Chapman, (Graduate Diploma in Law) and her social housing advocacy project, CommUnify, took the runner up £500 prize on the night. Nicola said: “We are really happy to take this gigantic cheque home. We will put it towards good use and hopefully make everyone proud. When you have the support that we have at City, you just want to come back and show everyone what you have done. “Even if we had not won, we would have walked away thinking that this was a day well spent. The festival opens your eyes to things that you would not be aware of or realise. That is something that I love about City, it is very diverse and the people that you meet are all so different. This year’s festival builds on the success of last year providing guests with an amazing range of opportunities to meet one another, solve problems and change lives. The social enterprise business model is one we fully endorse, and the social value that is delivered is so important. We are proud to provide a platform to help others build their own ventures and for so many inspiring stories to be shared. From Toast Ale, fighting the battle against food waste, one beer at a time to the London Early Years Foundation working to make childcare the best it can be, this year's festival has been fantastic and I look forward to seeing more of our students building better businesses.